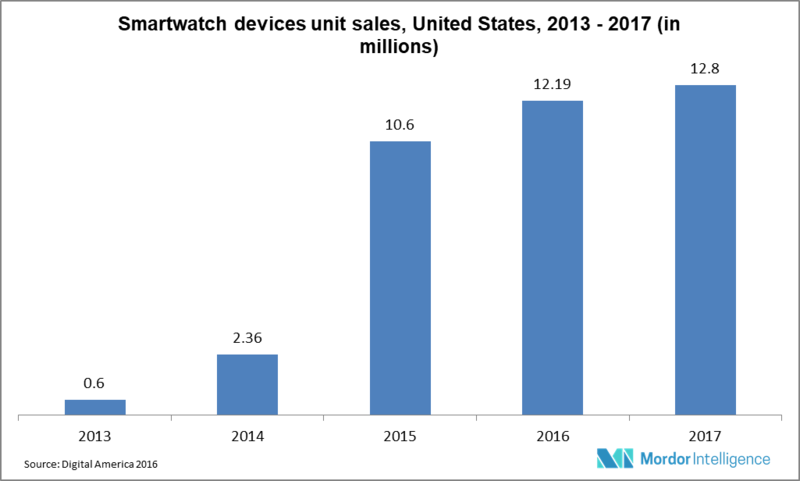 Globally, the number of smart watch unit shipments was estimated at 41.5 million in 2017 and is expected to reach 110.38 million by 2023, at a CAGR of 18.02%, during the forecast period (2018-2023). Smart watches are the new trend in the digital market and rapid advancements in Integrated Circuits (IC) technology is expected to propel further growth in the market. The world has already recognized the importance of mobile communication systems and this factor provides an additional surge for the growth of the smart watches market. The potential in the smart watches market is high, as several wearable companies, such as Catapult, Apple, and others are actively engaged in this segment, competing fiercely in a relatively niche market segment of consumer wearables. Virtual SIM card might change the face of mobile internet access. The integration of IoT technology can further enhance the capability of smart watches, where one device can serve all the purposes rather than multiple apps and devices. Technologies, such as 3D printing are helping the growth of the smart watch market. GPS and geo-tagging capability, biometric, and smartphone autonomous functionality are some exclusive features of the smart watch. The meteoric rise in demand for wireless sports and fitness devices is widely considered as one of the major drivers for the growth of the smart watches market. Currently, the use of smart watches among cyclers, runners, gym-goers, swimmers, and athletes is increasing rapidly, owing to their wide range of monitoring capabilities. GPS tracking, which can help track the distance, elevation climbed, and measure pace, is a key feature in a majority of smart watches, which attract athletes and climbers. Heart rate monitoring is a common feature in smart watches, which can monitor automatic, continuous wrist-based heart rates. Smart watches can easily track steps, calories burned, floors climbed, hourly activity, stationary time, and activity time. Additionally, multi-sport modes and automatic tracking features are available in certain smart watches. The wide range of features mentioned above serve as testament to the increasing use of smart watches. However, the presence of a large variety of smart watches with different sets of features, allows end-users to choose a smart watch that suits their requirement. Moreover, there is a large pool of smart watch apps in the market. Thus, the market is experiencing a healthy surge. North America has emerged as the clear frontrunner in the technology industry, having a sizeable impact on the economy, health and employment opportunities in the region. Smartphones and cellphones have become indispensable for the growth of various industrial sectors. Various critical infrastructure components in North America completely depend on digital systems to perform their missions. The digital technology industry provides the foundation for information exchange in all the sectors, including healthcare, and retail. Additionally, IoT is predicted to undergo massive growth in the coming years, and mobile technologies play a vital role in enabling the industrial growth. The advanced industries sector is highly metropolitan and varies considerably in its composition and depth across regions. Smart Watch Market Major Players: Pebble Technology Corporation, Sony Corporation, Samsung Group, Google Inc., Apple Inc., Qualcomm Inc., Neptune Pine, I’m S.P.A , Connected Device Ltd., Meta Watch Ltd., Timex Group Inc, Razer Inc., LG Electronics Inc. and Sonostar Inc., among others.